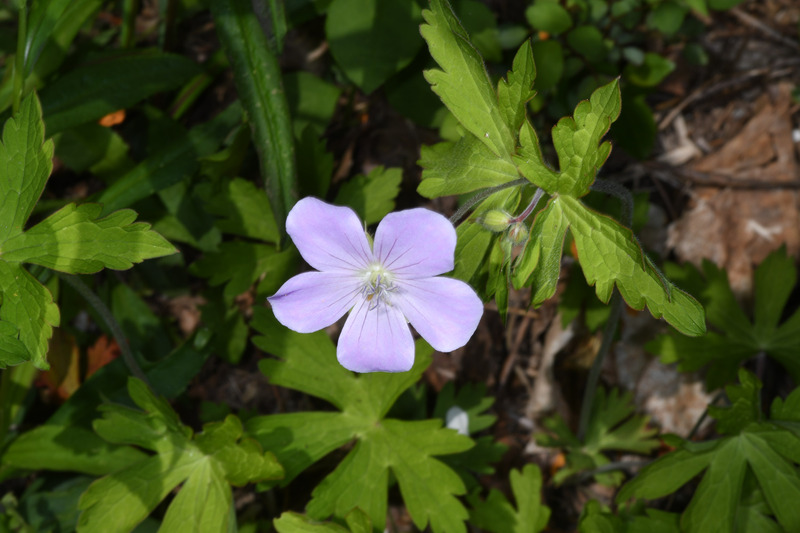 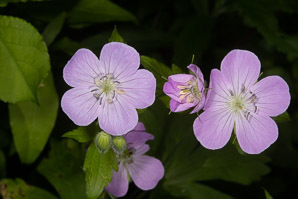 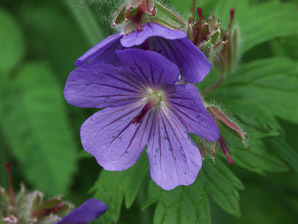 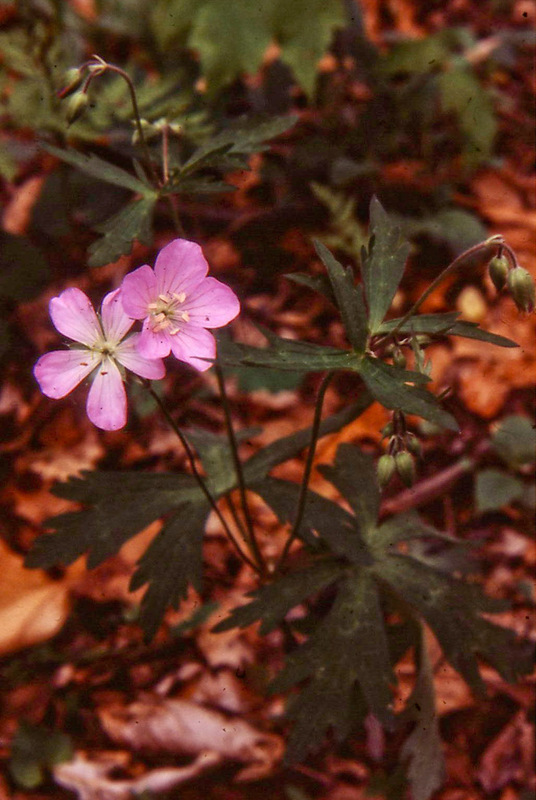 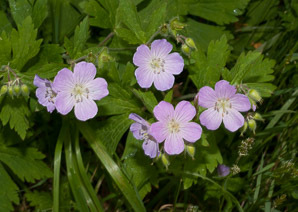 Wild geranium is native to northeastern North America. 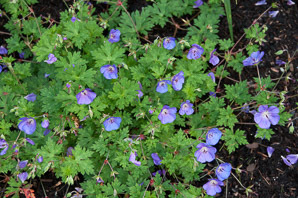 They prefer damp but well-drained soils, appearing in forests and also in full sun if there is ample moisture. 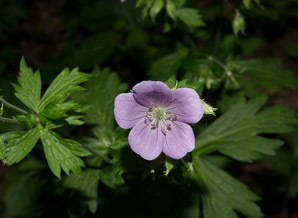 Plants: Plants are 12-30" (30-76 cm) in size, usually unbranched. They are quite often found in dense colonies. Leaves: There are two levels of leaves. A loose cluster of basal leaves, more or less obscured by foliage above, and opposite pairs of leaves on the lower part of each stem. 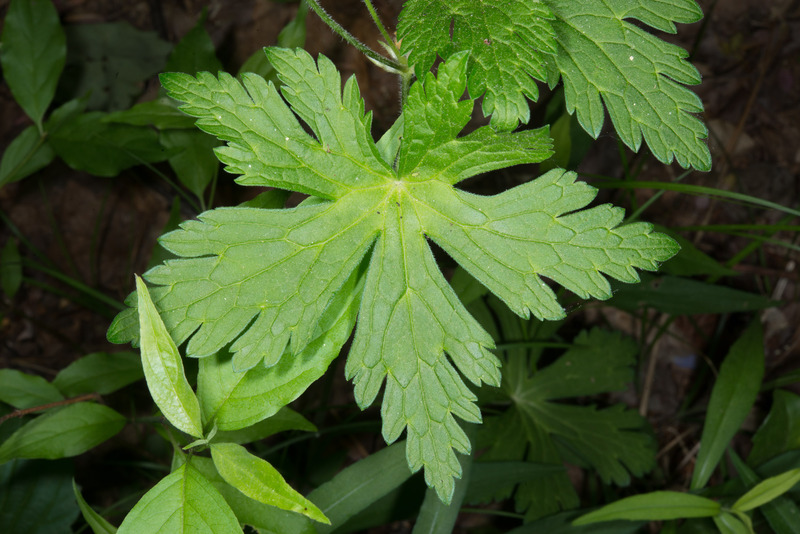 Leaves are hairy and palmate: deeply divided into three or five sections, each of which are once again divided. 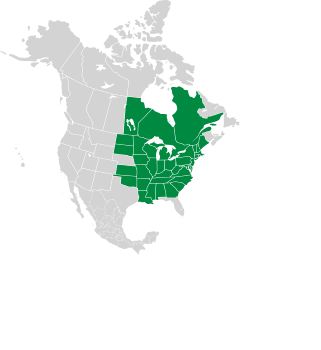 Each division is toothed. 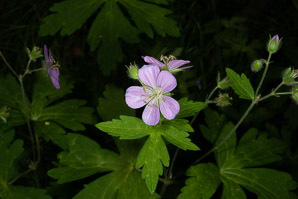 Their overall size is 4-5" (10-12 cm), on a long hairy petiole (stem) up to 12" (30 cm). Flowers: Flowers are attractive, pale to deep pink, lilac, or rarely white, ⅞-1½" (2.5-4 cm) in diameter, with 5 petals and 10 yellow-tipped stamens. 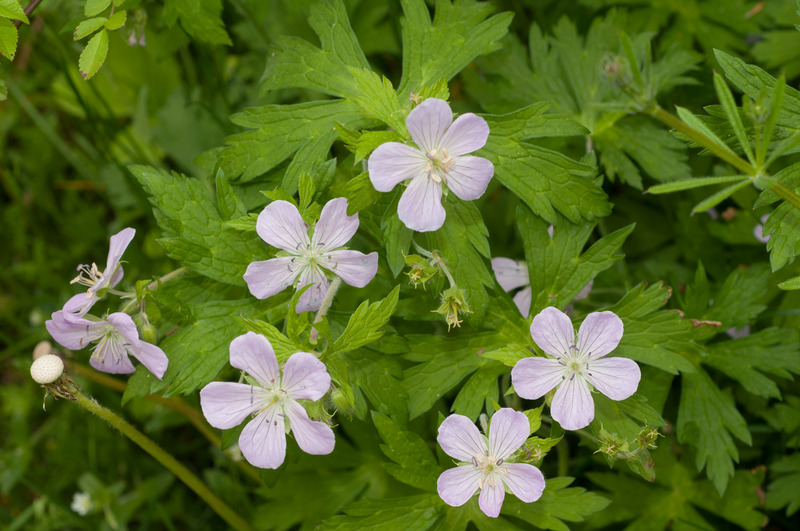 They appear in loose corymbs or umbels of 2-5, flowering from April to May. 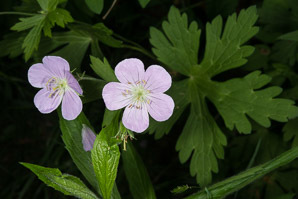 Fruits: Each fruit is a capsule with five cells, each containing a seed joined to a long beak-like column ¾-1" (2-3 cm). 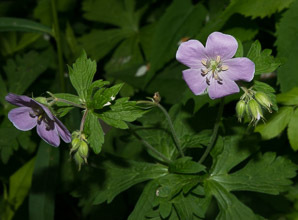 The common name cranesbill derives from the seed’s resemblance to a crane’s bill. 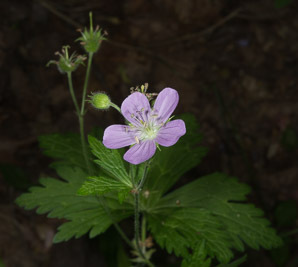 As the capsule matures, it dries out, finally snapping open to fling seeds. 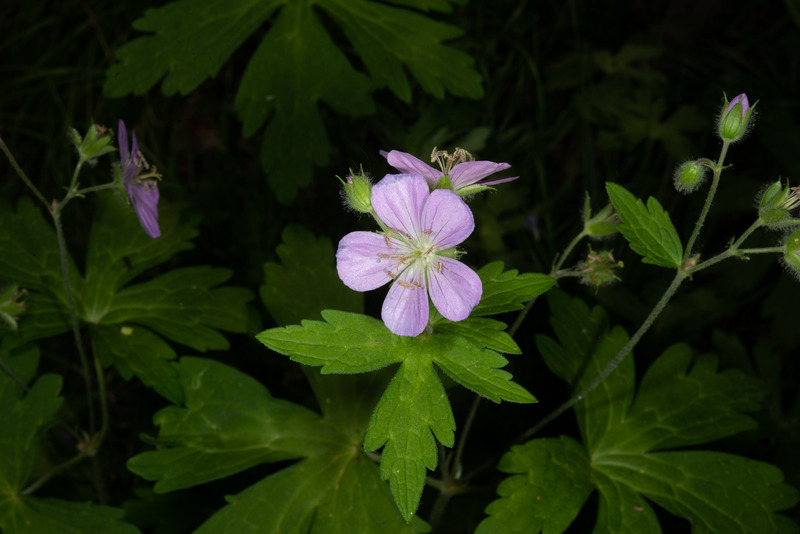 Geranium maculatum description by Thomas H. Kent, last updated 12 Oct 2018.